Taitusi Matia performs the national anthem at his graduation ceremony. 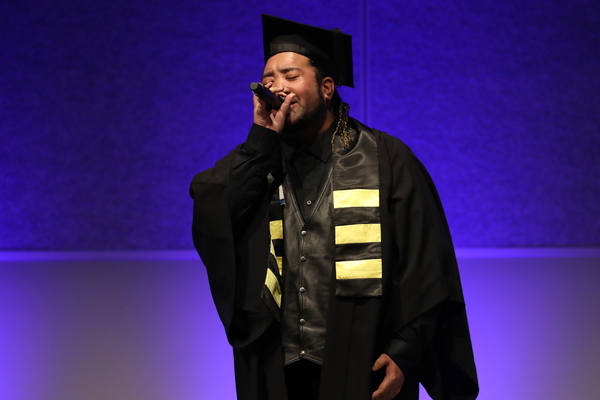 Keysborough student and singer Taitusi Matia’s has hit a high note, claiming a Kangan Institute award. 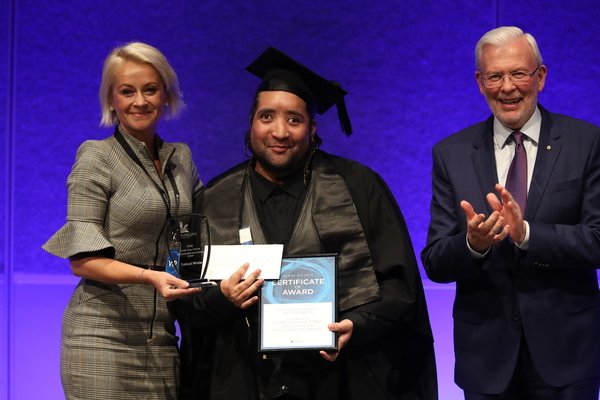 Mr Matia, who recently completed a Diploma of Music Industry, was awarded the institute’s inaugural Guide Dogs Victoria Inclusivity and Accessiblity Award. At the recent graduation ceremony, Mr Matia received the $500 prize and trophy. He was also invited to sing the national anthem in front of a crowd of hundreds including Broadmeadows MP Frank McGuire and Essendon football identities. Born with Crouzon Syndrome, Mr Matia’s vision and hearing have been impaired since birth. From early on, he’s had a strong love of music. However prior to his course, he’d never sang or played a musical instrument. He put down the award to hard work, and keeping on top of his study loads while taking long train commutes to the Broadmeadows campus. During his studies, he was assisted by a Vision Australia bursary that funded cutting-edge technology. Such as an ingenious reading-camera that converted writing on the whiteboard into text on Mr Matia’s laptop. Mr Matia is now studying a Bachelor’s degree in contemporary music at the Australian Institute of Music. “If you’re not learning, you’re not trying,” he said. He’s now trying to network to “get my name out there”, starting with gigs in a Coburg pub in June as well as open mike events.